The Gru of Despicable Me was, well, rather despicable. 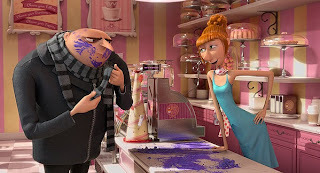 But while he’s still a surly neighbor, the Gru of Despicable Me 2 is downright domesticated. He’s doting father to this three adopted daughters, going so far as dressing up as a fairy princess in order to not spoil the birthday party of his youngest, Agnes. His underground minions and evil sidekick Dr. Nefario (Russell Brand) now produce jellies and jams, while admirers speak of Gru’s foregone plan to shrink and capture the moon with nostalgic reverence. And this time around, Gru (Steve Carell) is working for the good guys. The former evil genius wants back into the game, and his nemesis is a once invincible supervillain named El Macho (Benjamin Bratt), purportedly posing as Eduardo, the rotund proprietor of a shopping mall Mexican restaurant. Yet Gru spends more time worrying about his teenage daughter Margo (Miranda Cosgrove) and her blossoming interest in boys, as well as pining over Lucy (Kristen Wiig, quite good), his rail-thin redheaded partner and gushing devotee. The MacGuffin is the theft of some mysterious potion that turns anyone injected with it into purple, snarling creatures with appetites for destruction (Bath Salts?). What Despicable Me 2 is really about is, well, more and more minions. Yes, Gru’s pint-sized yellow helpers are back to bleep and blurp their way in and out of trouble. They have names, although none of them are important. And anytime the plot hits a stale patch—which is often—directors Pierre Coffin and Chris Renaud trot out the animatronic Twinkies for more airtime and purposeless misadventures. Still, Despicable Me 2 is more enjoyable than it has a right to be thanks to Carell’s zany yet wry wit and Wiig’s carefree confidence. Like that famous cream-stuffed sponge cake, the film is tasty to consume but not particularly enriching.